Tent Fjallfoss was developing a consistent order of arrival that held without much variation for the rest of the week. First to arrive was always Beat, breezing in as though he'd been out for a pleasant stroll rather than a thirty-mile backpack run. Twenty to forty-five minutes later, I'd zip open the canvas flaps, grumbling about being sore from "running too much" but always stoked on the day's travel through mossy moonscapes. Raj from Bangalore came next, quiet but thrilled to have made it through the day. Then came the two giant New Jersey Vikings, bellowing on as though they'd just been on the worst run of their lives, but with an air of confidence that told me they had no doubts in their minds that they would see this thing through. Special Forces Raj came sixth, with painful knees and a pronounced limp that seemed dire; but then he'd tell us more stories about his days pursuing Pakistani militants through the mountains, and we had little doubt he'd finish. Karley from Australia usually arrived around dinnertime, also stiff-legged but in good spirits. Last to arrive, often after most of the camp had already gone to sleep, was Chloe the New York triathlete. After running two, then three, then four of her longest runs ever back-to-back, she was hurting but determined not to quit on her own. "I keep waiting for them to tell me I'm too slow," she said. "But they haven't yet, so I guess I just have to keep going." Stage three began on the most brilliant bluebird day, with a light breeze and temperatures that must have climbed all the way into the 50s. After the brutal gales and sub-freezing windchills of stage two, it felt like a warm summer day in California. 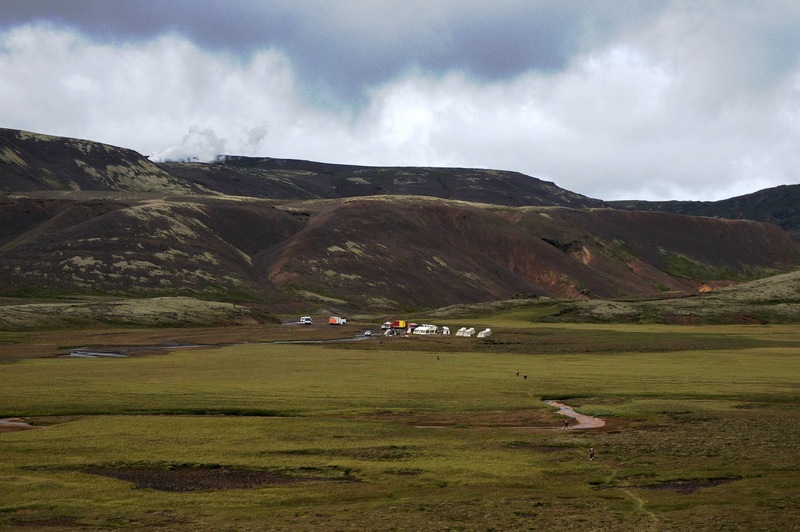 Because we'd retreated to the relative calm of the valley the night before, the race organizers bused us back to the "Black Sand(blasted) Paradise" where we were supposed to camp before the start of stage three. The terrain reminded me of a place I used to visit in my youth to go spelunking and ruin hiking shoes — Craters of the Moon National Park in Idaho. 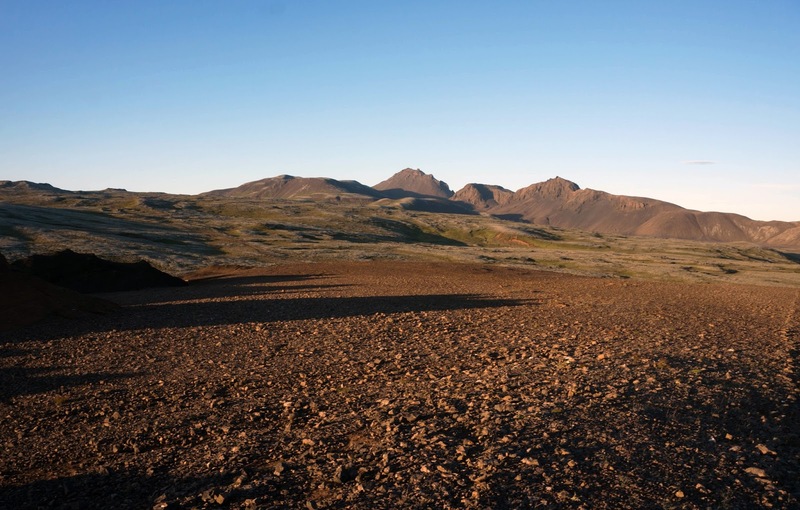 Unlike Craters, this moonscape butted up against a massive glacier. Truly a unique corner of the Earth. The stage starts were always entertaining. The bunch of 250-some racers spread out very quickly, so overcrowding was never a concern. But for the first half mile or so, everyone went off in a fast-paced group run as though we were starting the New York Marathon. At my unwaveringly consistent pace, I was lucky to hold onto the back third of the pack at the start, but within a half mile I'd be passing whole crowds. I enjoyed the aesthetic of the stage starts, though — open, vast, often monotone landscapes were suddenly injected with a thin vein of colorful humans. 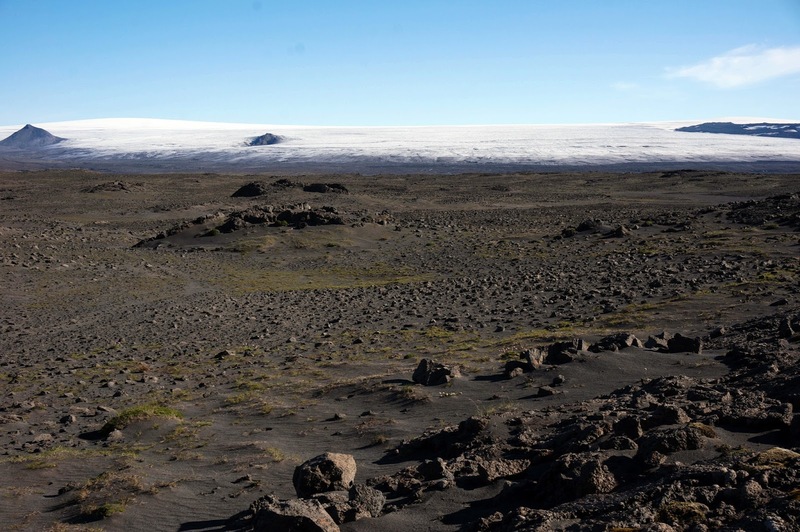 Stage three was a compelling route, across a wide valley between a chain of small mountains and the Langjokull Glacier. 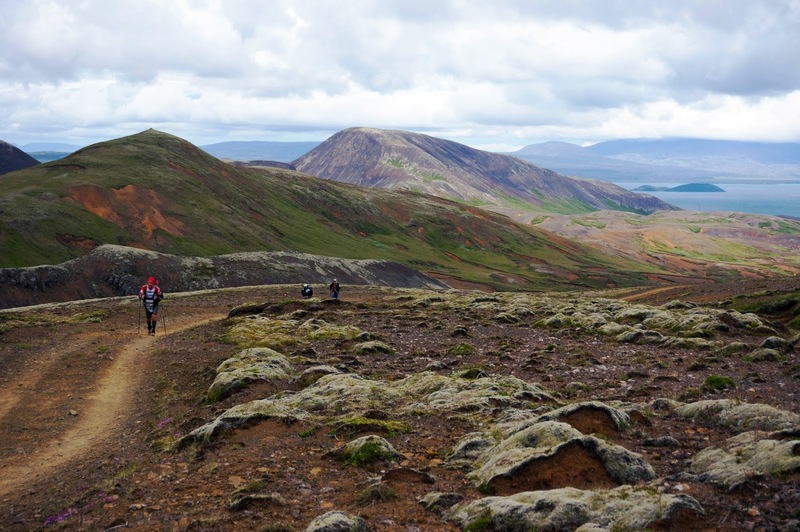 We were still paralleling what passes for a main track in central Iceland, the rugged Kalvegur road. 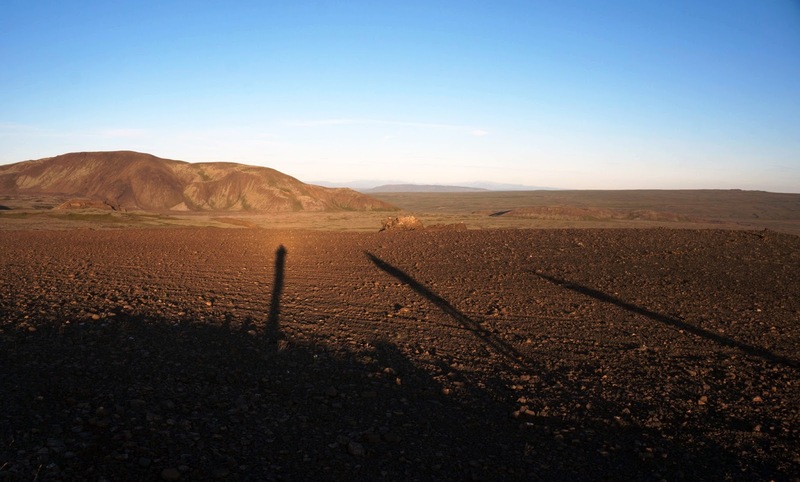 But now several dozen miles displaced and separated by a wall of barren mountains, this black ash desert often had the remote feel of recently discovered territory. Still, even in what felt like the most remote segments of the course, we'd often come across random street (or village, I couldn't tell) signs in the middle of nowhere. 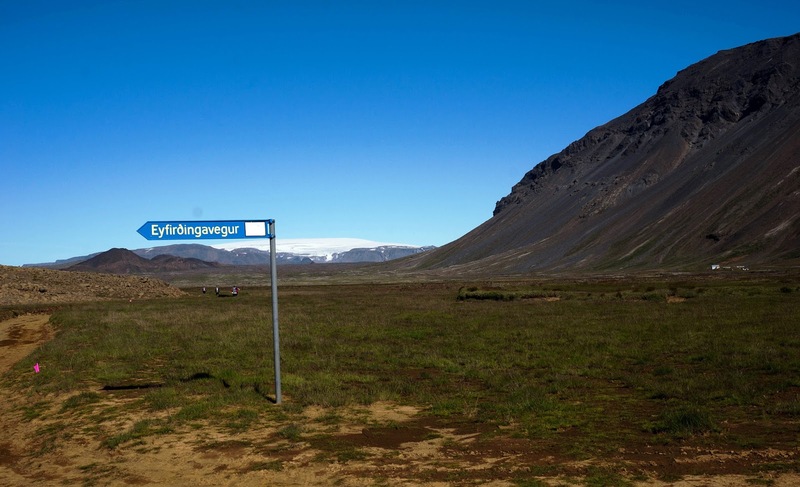 The Icelandic language is a remnant of old Nordic languages, unphonetic and unpronounceable. But I've never viewed a language that looked so beautiful. It's like modern art, set against an ancient backdrop. 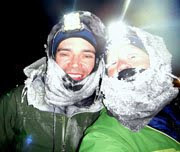 For much of stage three I ran with Martina, a California friend who joined the RTP adventure with her partner, Harry. Martina and I actually ran in very close proximity for the first two stages, but I didn't realize we were similarly paced until day three. I yammered on about similarities to sled-dragging as we hoisted our backpacks across soft sand basins and we chatted about life back in California. It was fun to have someone to run with on this beautiful day. But I learned that while I like to walk and make pit stops and take photos, Martina likes to run, nonstop. She had been feeling under the weather for most of the race so far, but I still had a tough time keeping up with her steady running pace, and got dropped after one of my longer pit stops. After some time we left the jeep track and continued overland. I was relieved, because I can't run this stuff. It's bumpy and jagged and loose with hidden hollows underneath the moss that threaten to trap feet and twist them in painful ways. 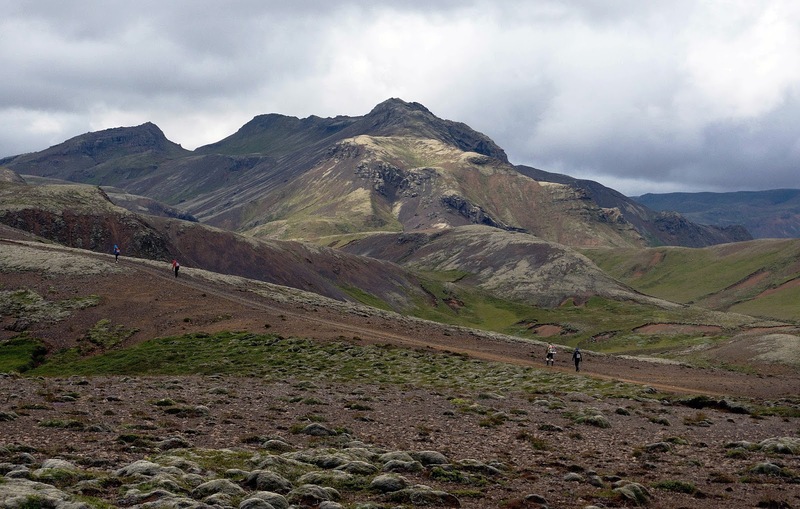 I'd stubbed and probably sprained my fourth toe on my left foot in such terrain during stage two, and the toe remained painfully tender for the rest of the week. I'd already decided that running the overland terrain wasn't worth risking an ankle or knee injury that would pull me out of RTP Iceland, or worse yet, unable to start PTL, and decided to take the off-trail stuff conservatively from that point on. I think this was a good decision. Indeed, after stage five I saw at least three competitors with stitches in their foreheads, and even more with more minor head wounds after tripping and smashing their faces on rocks. Plus, self-preservation was the perfect excuse to dial back the pace, look up frequently, and absorb the vast beauty surrounding us. 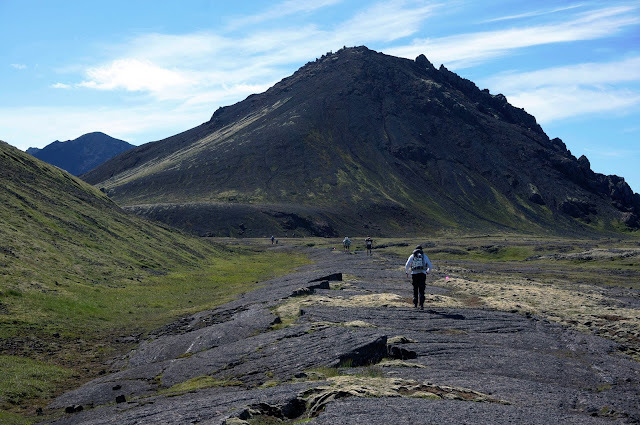 The off-trail hiking was pretty awesome, especially on big slabs of lava rock, so recently formed that you could still see ribs tracing the pattern of the lava flow. 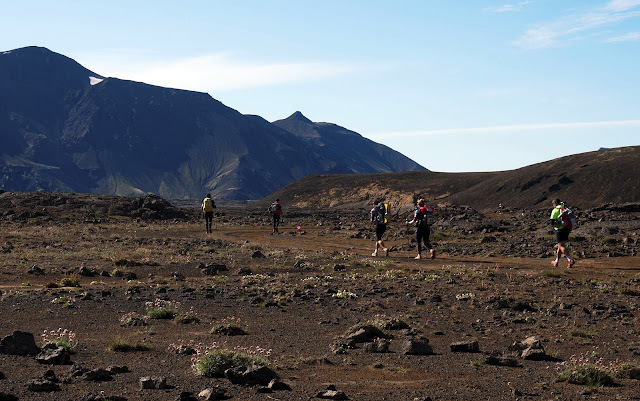 About two miles from the finish, I caught back up to Martina, who was having difficulty negotiating a jeep track that had been surfaced with unpleasantly large and loose lava rocks. 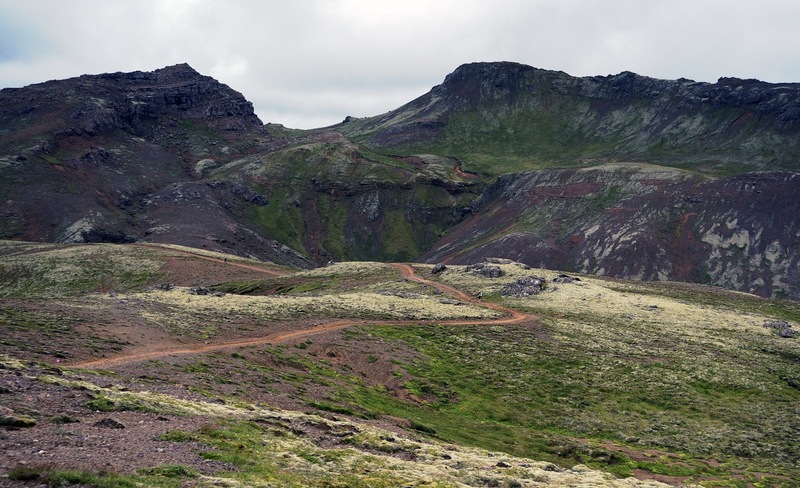 Honestly, it was a bad enough that I had a hard time imagining any vehicle driving that track without popping a tire; but between my trekking poles and cushy Hoka Mafates, I felt more than adequately equipped to handle such brutal terrain, and I was running again. 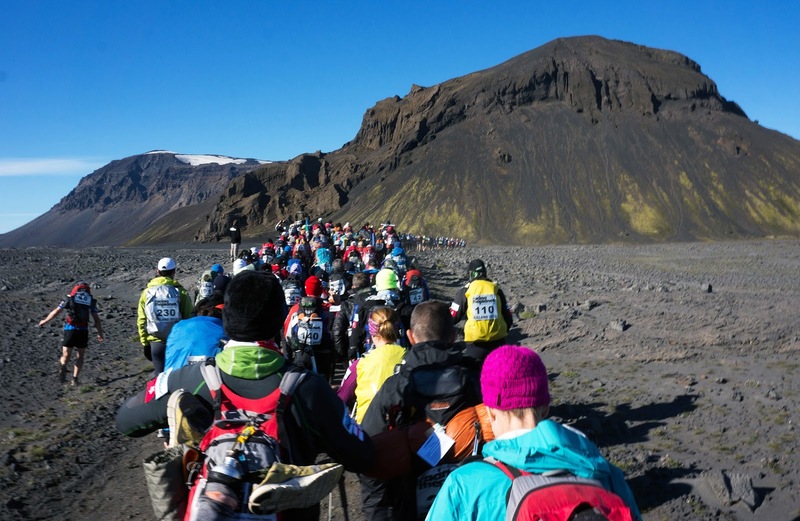 I ran with Martina on the steep descent toward the Thingvallavatn Lake, and we finished the stage together, 27.2 miles in 6:40. I'd managed to get through stage three without feeling too hungry during the run, and I even had a granola bar left over as well as one of my higher-calorie freeze-dried meals (Chicken and Rice, 780 calories) for dinner. Not only that, but Beat even shared his Raspberry Crumble dessert with me (you know a guy loves you when he's willing to split such a valuable ration.) Despite feeling sore from "too much running," I had plenty of energy left over for evening, so we went on another excursion up the nearby hill from our camp site. Joining us was Beat's new friend Dan, a Wisconsin native currently living in Melbourne, Australia, who'd formed something of the alliance with Beat. The two of them ran most of the race together. 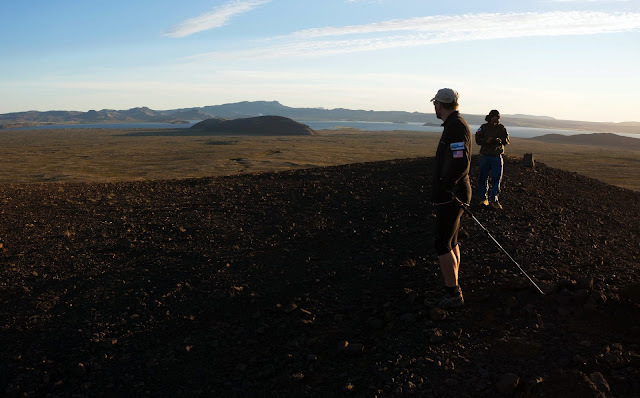 Nothing stretches out the sore muscles better than a little walk on a steep slope of loose sand and lava rocks. 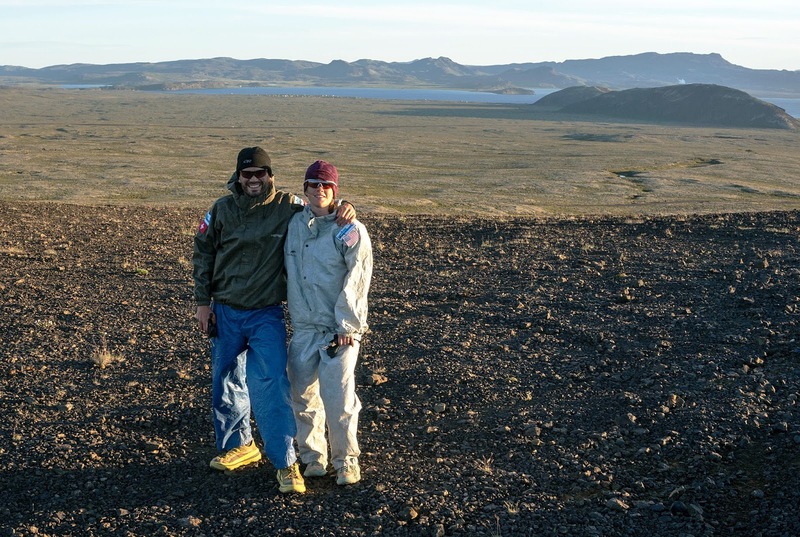 I posted this picture because it shows my astronaut suit in all of its stylish glory. But honestly, the DriDucks gear was warm, I felt dry even after a day-long deluge during stage five, so I can't complain even though the suit combined with my buff and balaclava made me look, as Harry tactfully put it, "like a homeless person." 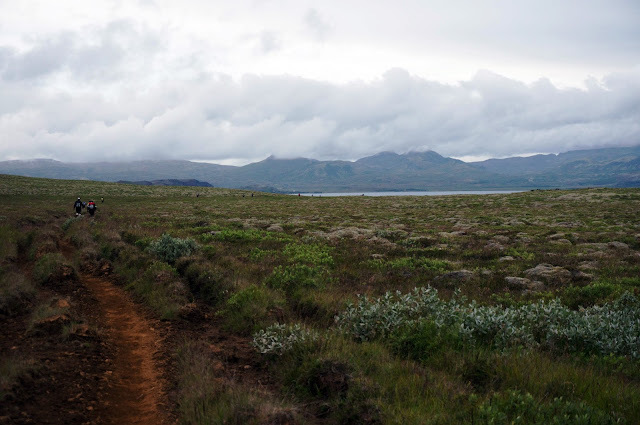 The quiet evening walks were one of my favorite parts of RTP Iceland. The wind had usually quieted some, and the low-angle Northern light created long shadows and delicious colors. The sunset on this evening was also quite nice. I didn't photograph it because it was nearly midnight and I was grumpy because I was still awake, traipsing toward the toilets and still hoping that this would be the night I'd finally sleep though. Insomnia is weird like that. I'd be so exhausted and sleepy during the day but unable to sleep when I finally laid down at night. Next day, I was again so sleepy that I felt I could easily lay down next to the trail and take a nap, right there. I admit by stage four I'd resorted to regularly popping caffeine pills. These probably didn't help my ability to sleep at night, but it was becoming a necessity to get through the days. 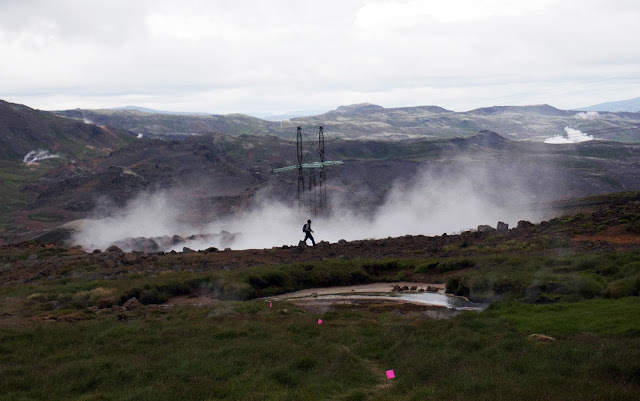 Stage four was my favorite stage, a dynamic day that included rugged horse tracks, farm fields, a climb back into the mountains, and a very cool geothermal area. It even started with an intriguing obstacle, a crawl through a 400-meter-long lava tube, which was was so narrow in spots that our Viking tentmates actually got stuck. 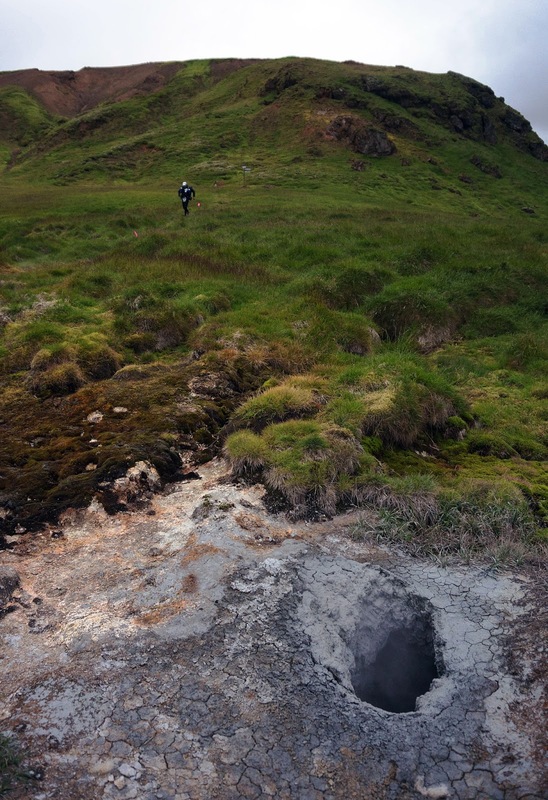 The underground lava tube (which I didn't take any pictures of because I left my camera in my pack for this spur segment) started about a kilometer from the race start, resulting in much jostling for position on an off-trail descent through mossy rocks. I didn't want to hurt myself and I also didn't want to get caught up in the competitive half of the pack, so I held back. As a result, I got stuck in quite a traffic jam in the dark and jagged cave, with people behind me almost impatiently shoving as people in front of me teetered and scrambled very slowly over the rocks. The lava tube would have been awesome without the crowds, but the way it was positioned at the start of the stage made it less than enjoyable. Ah, well. In my sleepless state, I had some difficulties negotiating the horse tracks in the middle of the stage. The parallel singletracks were pressed into the loamy soil with hard edges. These narrow trail canyons were also strewn with rocks and moss, making for difficult running unless I really paid attention. 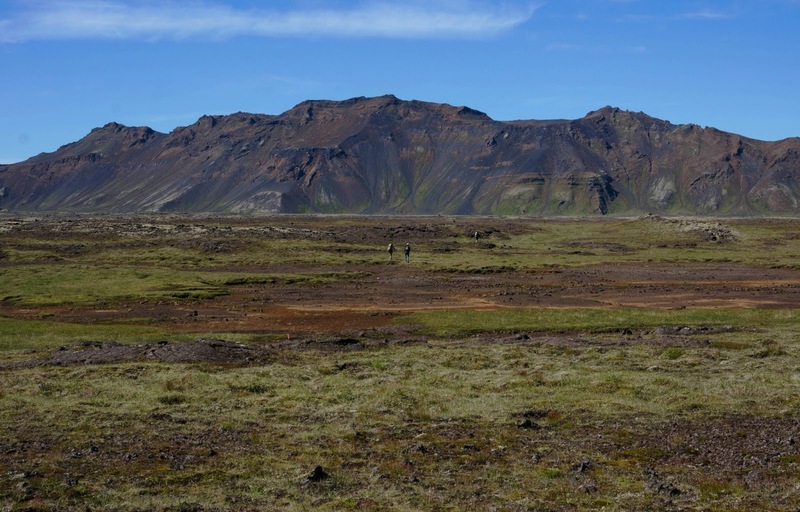 I did enjoy traveling through the farm fields, though — a new side of Iceland that we had not yet seen. In Iceland, horses roam the open landscapes in the same way cattle do in the Rocky Mountains. 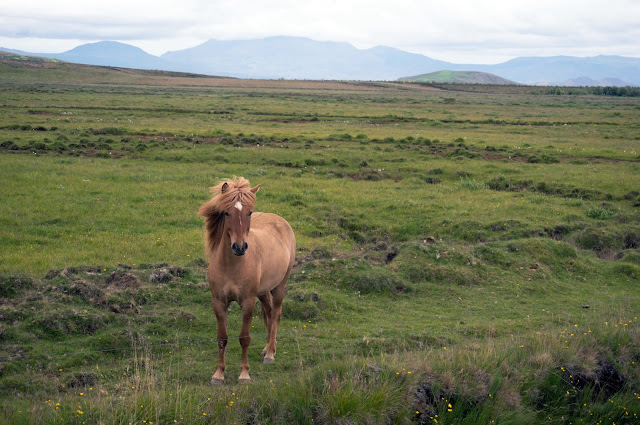 Icelandic horses are beautiful creatures, small and stocky and bred for a rugged life. This horse walked toward me and followed me along a fence for several meters. When I stopped, she stopped. She had a blotch on her face that reminded me of my cat, and I had one of those "oh please can I take the nice horsey home" moments. Then began the climb into the mountains, and again I was relieved. 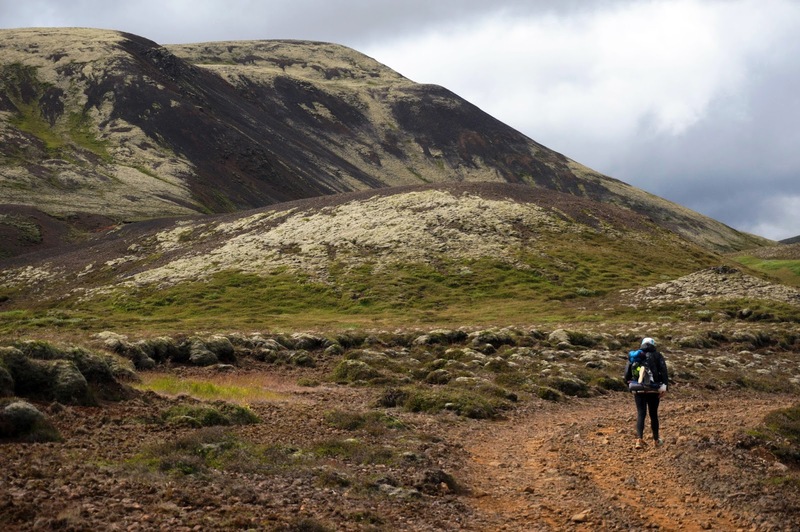 I always was relieved when the terrain became just a little too difficult for running. Racing the Planet is a running race, and I'd made an honest effort to run when I could, even though running was often strenuous and exhausting and I didn't even necessarily believe it was faster for me. Earlier in this stage, I GPS-tested myself jogging along a flat farm road into the wind, "running" hard at 4.1 to 4.3 mph and walking steady at 3.6 to 3.7 mph. Still, I come to these racing events to challenge myself. Running, even slow running, is quite difficult for me. As such, it made the most sense and felt the most satisfying to run. But it sure did feel good to climb, something I'd trained to do with some efficiency, and those same speeds — around 3.5 mph — didn't feel any harder on a solid uphill grade than they did on the flats. 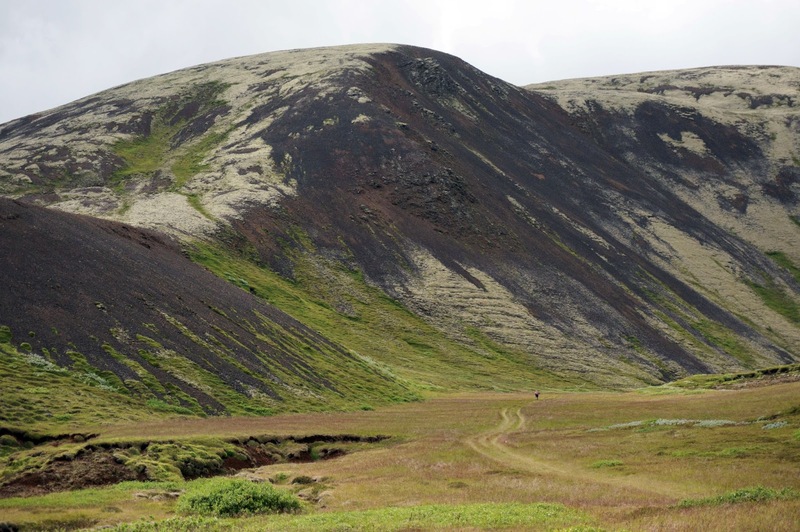 And these mountains were simply gorgeous, with mossy mounds and streaks of bright colors, even in the flat light of an overcast afternoon. As the afternoon wore on, sleepiness clamped down, and my inhibitions began to break apart. You know how some people get drunk and then believe they've suddenly become really great drivers? I'm the same way with fatigue and athletic risk-taking. I'm *not* arguing that this is a good thing. But as we started down a series of very steep and rocky descents, I thought, "Forget being careful, I am going to run." And run I did, only marginally in control, poles clacking wildly against the rocks and screaming "eeeeeee!" as a cloud of dust billowed behind me. I caught up to Martina at the bottom of the second such descent; she turned to me and, I think possibly before realizing who I was, said, "You are ruthless on those downhills." I'm not sure anyone has ever paid me such a high compliment about my running prowess. "I am seriously risking injuring myself," I said with a dopey grin on my face. "But wow is this fun." At the bottom of the descent, we came to a geothermal area along a shallow, grassy slope. I'd seen the steam rising up from the valley and knew we were approaching a hot spot, but I didn't realize how close we were actually going to get. Shortly after stepping off the road, I nearly put my leg into a small basin of boiling mud. Whoops; gotta pay attention. But I was thrilled to be there. When I was a child, my family visited Yellowstone National Park nearly every summer. 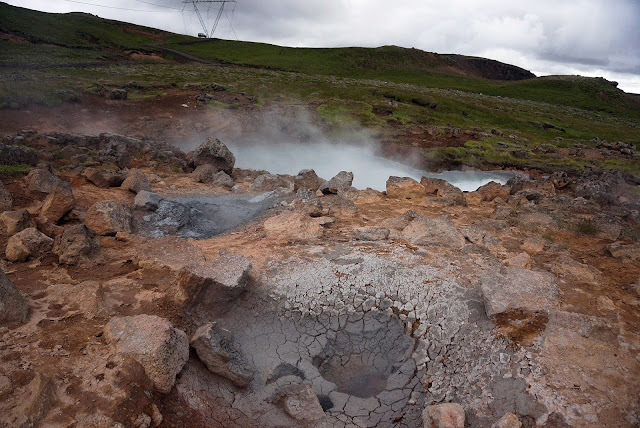 We'd tour the boardwalks, gazing into boiling springs and watching geysers erupt. My favorite feature in Yellowstone were the "mud pots," gurgling and popping like a witch's cauldron. A group of race medics had gathered around one of the hot springs. I thought perhaps a fellow racer had been less lucky than me at avoiding clumsy disaster, but as I approached I saw one of them holding a basket of eggs. 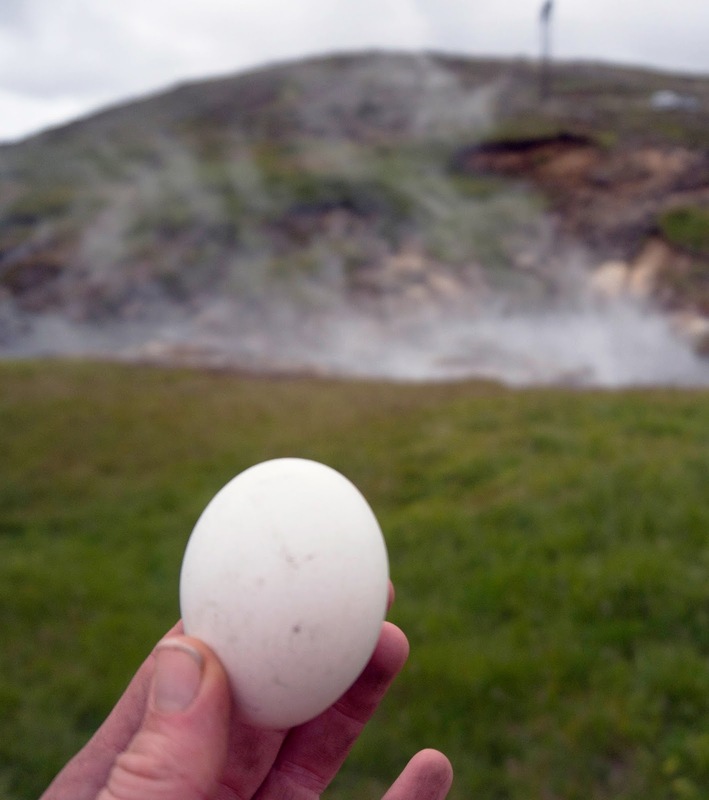 He handed me one of the eggs and said, "Hard-boiled right over there in the hot spring." A single hard-boiled egg — a bundle of much-needed vitamins and protein that could not have been better received if it was a gold bar. When you've been living off of limited processed crap for four days, a hard-boiled egg is like a gift from heaven. Days later, after everyone had rested and showered and eaten huge banquet meals, people were still talking about these eggs. 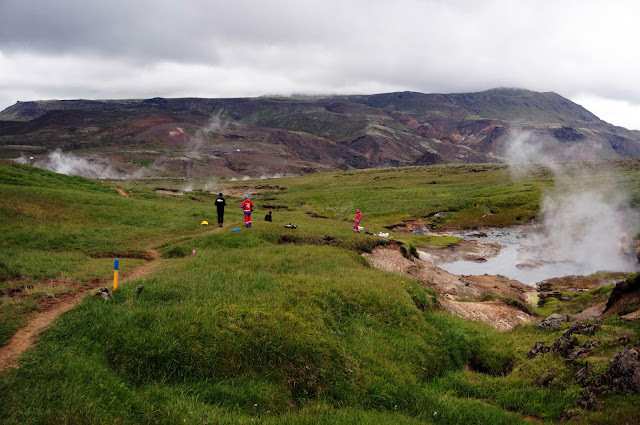 I continued to get a big kick out of the traverse across the geothermal area, which had colorful mineral streams and boiling springs around every corner. A nearby geothermal plant converts some of this energy into electricity. I was extra careful at the stream crossings. Wouldn't want to melt the Hokas. 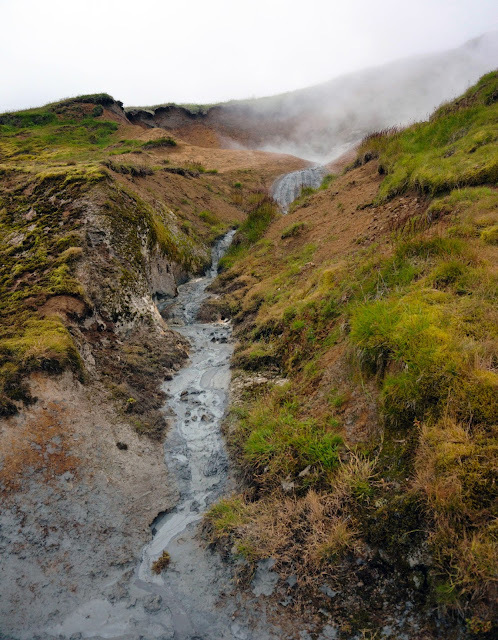 The weather was cold and windy again on this day, and the hot springs looked appealing ... if just a little too boiling. I stepped off the route at another small mud hole to gaze into the abyss and see if I could spot the bubbling clay. While I was crouching here with my backpack partially overlapping the flagged route, three other runners pushed by somewhat impatiently. I moved over some more to get off the "trail" and looked up toward more cauldrons of steam farther up the hill, which we were going to miss entirely. I wanted to stay. 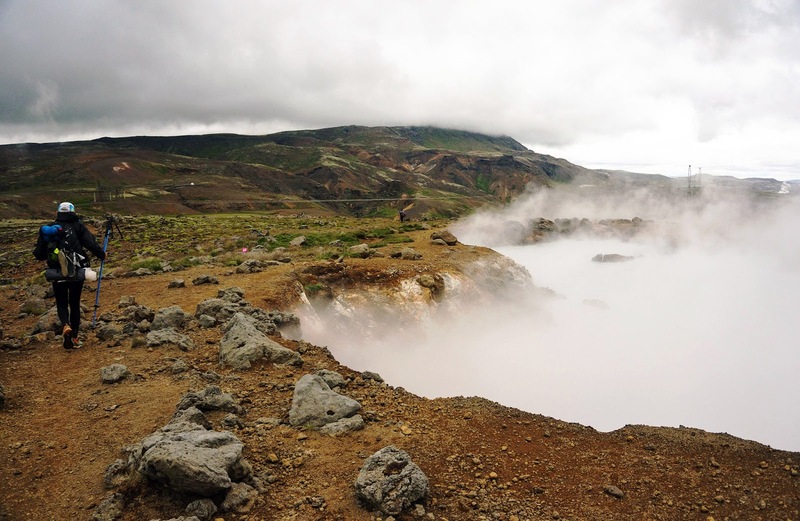 It would have been wonderful to spend the whole afternoon wandering through this area, eating eggs on the shoreline of boiling hot springs and checking out the mud pots. I had one of those unsettling moments I occasionally experience, in which I question the whole endeavor — "Why are we just rushing through all of these beautiful places?" I have my reasons for the deep enjoyment I draw from racing, and for the most part I don't feel the need to apologize for them anymore. Although I'll always be a hiker and bicycle tourist at heart, I appreciate these opportunities to break out of my comfort zone, push my limits, and occasionally chase pre-set parameters so outrageous that I'd never have the notion or courage to pursue them on my own. Reaching these limits and pushing beyond them is immensely satisfying. But every so often, honestly, I do just want to sit back and smell the roses. Or sulphur, in this case. Happily, stage-racing events such as this let us have it both ways. I lingered a little longer by the hot springs and then reluctantly continued the last four kilometers toward camp, which was set in an open valley surrounded by steaming hills. There was one river crossing on the way to camp that I had a lot of fun with — the water was ankle- to shin-deep and just a little too wide to jump. I decided I was going to go for the long jump rather than take my shoes off to avoid getting them wet, as I watched others do. I backed up about thirty feet, launched into a sprint, and actually screamed "Geronimo!" 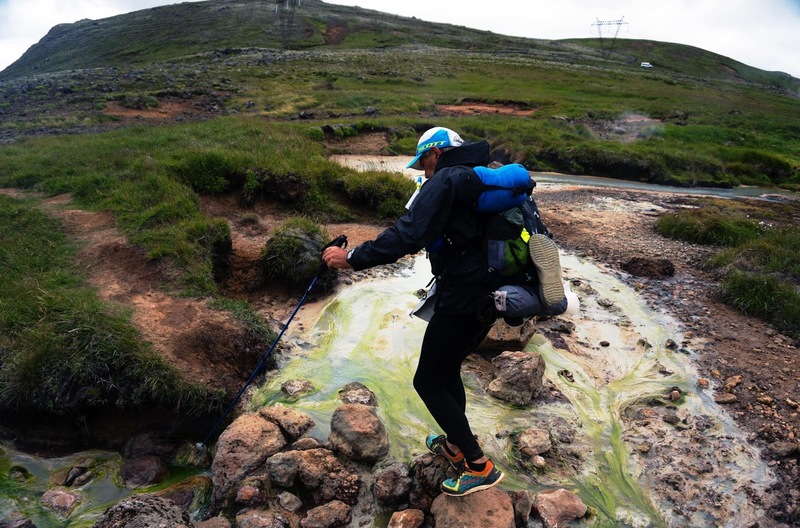 (remember, I'm sleep deprived) as I planted my trekking poles mid-stream and vaulted over the water. I nearly made it ... the back end of my right foot did land on the edge of the stream. Luckily, Hokas are mightly tall shoes, and I didn't get anything important wet. Stage four registered 25.1 miles in 7:18 on the race clock, although my GPS recorded 8:28 overall with a moving time of 6:01, so I'm not exactly sure how the math worked out on this day. No matter how we measured it, though, it was my favorite stage; I still felt healthy and strong and stoked about the possibilities of the final full stage of the event, "The Long March." Seriously loving this report...in fact, going to google RTP now. Your adventures inspire me! content - lacking. The use of I, me, my become overwhelming to the reader. effort - It's a shame so much effort goes into your writing and it might as well be a spreadsheet of miles logged and injuries overcome. Anon, it's fine not to like my writing style or the subject matter, but your only specified criticism amounts to: "You write too much about yourself on your personal blog." Um, okay. I wouldn't characterize the blogging I do in this space as "effort." It's my relaxing hobby, like watching TV or surfing the Internet, which is the main reason I've kept it up for nearly eight years, over many life changes, when the original purpose of the blog (to keep family and friends back home updated about my life in Alaska) ended a long time ago. I keep this space public and respect that this means I'm open to feedback/criticism. But if you're really in the Internet trolling business of grading personal diaries, you should probably take your efforts elsewhere. I feel no obligation to correct your red marks. Ignore Anon. I enjoy the blog very much, BECAUSE it tells of a personal experience. Well, that and the gorgeous pictures. Beautiful photos AND writing Jill! Like another commentator said, you have got me Googling RTP! I agree. I love hearing your side of the story. Followed along online and many others were in horrible condition and shape. You have a much more positive outlook about the stages and the weather and it's refreshing to read. Thanks for sharing esp. the photos. Iceland looks so interesting. These pictures are remarkable! Thanks so much for sharing. Anon's full of it. I find your blog to have much more content than most. Even if it didn't, I'd come just for the pictures! Jill..curious..how long does it take for your sleeping pattern to normalize or reset after such efforts and the bouts of insomnia they produce? As always, I really enjoy and look forward to your posts. 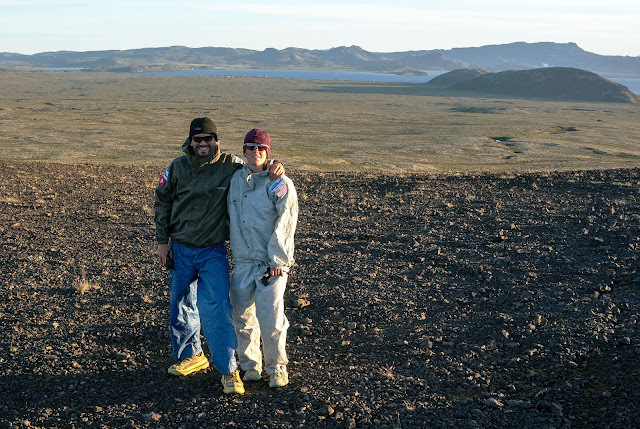 Thanks Carey ... recovery from RTP Iceland hit hard because we turned to California just a day later. I usually experience return jet lag in the form of insomnia, but upon return here I slept a ton. I'd fall asleep at 9 or 10 p.m. (early for me) and stay in deep sleep until 8 or 9 a.m. And yet I'd still feel very jet lagged during the day. It's started to normalize, but it felt like it took a while to catch up. Through genetics I'm prone to bouts of insomnia. It hasn't yet been prolonged or serious enough to prompt me to seek medical help, but I'm more seriously considering it for the future. I have a doctor that's pretty strict with medications, though, and I don't think my difficulties count as clinical, yet. But it does add a layer of difficulty when it happens during an endurance race, which is often the case. I'm more prone to insomnia when my bio rhythms are disrupted. I think it's admirable that you continue to do what you love to do even though it can lead to insomnia, many would avoid it. As I've gotten older my ability to sleep anywhere at any time has changed, it's simply not easy anymore. I'm sensitive to environmental conditions in regard to sleep and I can get stuck in the "on" position if I'm exhausted. It's something I've had to learn to navigate in the last 10 years. Though I have thought of you and how you solider on thru sleep deprivation when I'm experiencing it, makes me feel less frustrated to know I'm not the only one, so thanks for including it in your writings. Glad you're feeling more normal, sleep is such a beautiful thing. Great pictures (and content!! ), Jill. What camera are you using? Your pictures seem crisper than my Canon Powershot. I like the Canon because it's so compact and I do get better pictures with my Panasonic DMC-LX5, but it's not practical to haul it on runs. Good luck at PTL! I'm looking at UTMB next year. Thanks Steve. I used a Sony Nex-5 with a zoom lens, which would probably qualify as "not practical to carry on runs." But I view it as a great compromise for photo quality and functions without having to own or carry a full DSL. But it does have the drawback of being quite large for a point-and-shoot, and also not waterproof or shockproof, requiring extra care. All of my shots from stage five were an ordeal because I had the camera buried in my pack to keep it out of the rain. But I still took a few. I'm Anon and I'm not a troll. I've followed this blog off and on for years hoping for some development. I do love the pictures and I respect you for living your life the way you see fit. I'm jealous of that! What I want to see is less stats and more interaction stories. You've traveled more than most of us and yet I don't feel the places you've been. Spreadsheets. I say keep it up, you have readers that love this and I will tune in to see the pics. I said my piece and will not say another word. I also started a blog when I moved away to keep folks in touch and found that the I, me, my syndrome really got old. Do what you will but it would be interesting to hear about the 2 people on the bench after you climbed 4001 ft after you jumped off the train and not that you climbed 4001 feet. If you had a way to receive this stuff without making it public I would have chosen that but I couldn't find a direct email link. I apologize for making snap judgements. I appreciate your thoughtful response and valid criticisms. I agree that the stories of others are a compelling part of travel writing. My block comes from the fact that I write on here about my real life, and in real life, I am a fairly deep introvert. The stories of the two older people on the bench in Switzerland are probably quite interesting. However, didn't speak with them. The woman pointed to the paragliders and I said "wow." That was our entire interaction. Bringing myself to engage with strangers requires a well of emotional energy that I don't always have to invest, especially when I am physically fatigued. So I have a difficult time talking to strangers, and I do not feel comfortable revealing more than cursory details about my family and friends in this public space. Thus the shallow appearance of the other "characters" in this space. I do want to make an effort to delve deeper into the wider world of endurance sports on my other blog, Half Past Done, with interviews, profiles, and reporting. That project is still finding its legs, but telling the intriguing stories of others is my goal. Same with two biographical books I am currently working on. Perhaps someday I will take on a focused travel writing project and in this case I would make all the extra efforts to learn everything I could about others around me. But "Jill Outside" is something I consider both my journal and my cathartic personal outlet. For that reason, its subject matter won't ever extend all that far beyond Jill. Nobody knows the depth of what it takes to suffer to the extremes people do...Just for the F of it. Just to feel alive. You feel alive! Do what makes you live because there will be that last sunset we all see or don't see....but it's there.